This Water View Table is sure to be the life of any dinner party. Made of stainless steel and featuring a soft swirl finish, this piece exudes elegance and nature all in the confines of the dining experience. 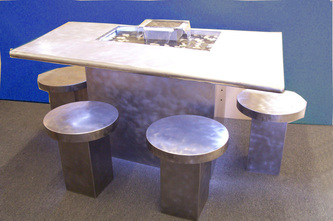 The focal point of this piece is its water feature in the center of the table. Featuring a smaller elevated pool filled with rocks, water spills out into three directions, creating three waterfalls that fall into a larger body of water that is lit up. As the waterfalls cascade, a touch of light provides a glowing ambiance to make this Water View Table a memorable setting for any meal. 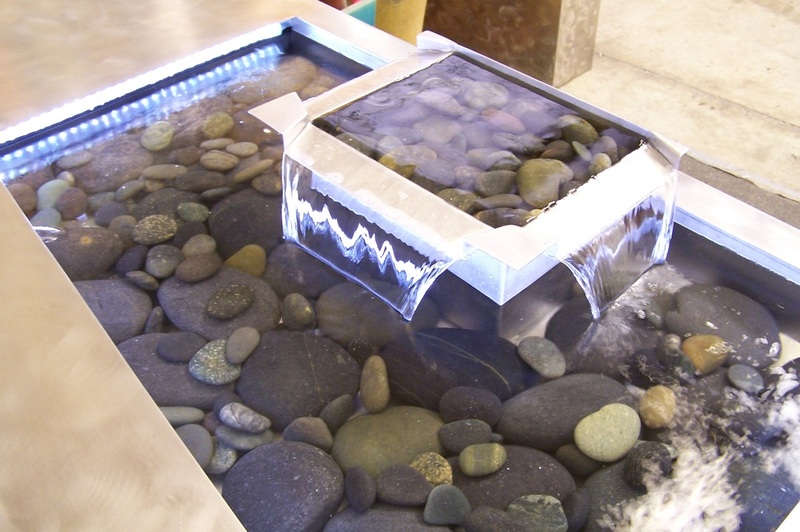 Relax and dine by the sound of falling water at this exotic table. Even further, the tabletop surface can be customized with wood, granite, glass, or composition material to give you further aesthetic options.